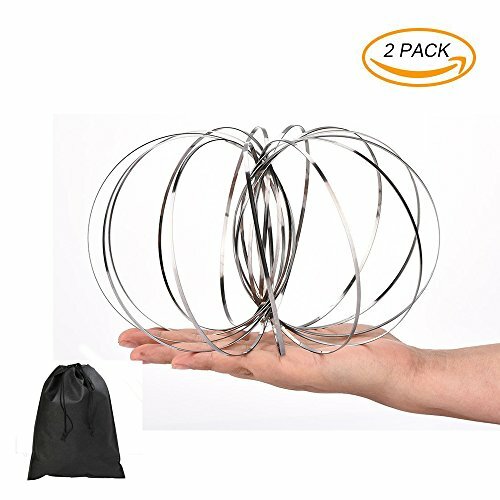 【Funny Kenetic Spring Toy】: Rolls along your arms, this metal flow ring toy is easy to use, slide it down from one arm to another,The flow ring opens like magic,let a person feel very novel and fashionable. 【Relieve Anxiety & stress】: Play it alone or with friends, take a moment from your busy day and release the pressure , this interactive spring toy will give you a different visual experience and relives stress and anxiety. 【HIGH QUALITY】: Our flow ring is made with a single piece of 304 stainless steel which is welded at one point with a smooth connection that won\'t break, and it has Smooth edges which won\'t hurt you. 【Portable in your pocket】: Using your palm gently press and rotate counter clockwise on a flat surface to bring it back to its original position. The flow ring is portable for fun on the go. 【2 size for Kids and Adults】: Package includes 2 size: 4.33 inches and 5.11inches, especially designed for kids and adults, you can play with your children, enjoy your time together. 2 pcs Kinetic Spring toy.